"Oh! 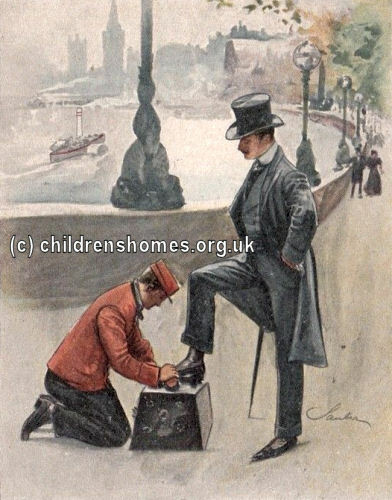 I was very anxious to see whether anybody would employ the shoe-black; and glad indeed was I to observe a good, honest, fat-sided Englishman approach the little boy and place his great boot upon the top of his box. The boy touched his cap, set to work upon his knees, smartly brushed the mud from the man's trousers, turned them carefully up, attacked the muddy leather with vigour, and soon made it a yellow-grey, then he applied the blacking and briskly plied the polisher until the boot was bright So was the other foot finished. The man paid his penny, the boy touched his cap, and the work was done. Another, and another, and another, came and paid and went. First clerk wishing to show off at his office, then a milliner girl who had spattered her thin shoes, next a burly farmer striding along in his huge top boots, a fish-wife next, a whiskered foreigner, and then a peer of the realm. The shoe-blacks that day obtained a footing in London." Pitches were allocated to the boys by the police, with the Brigade operating along the Strand, Piccadilly, Regent Street, Holborn, and at the Parks. Because some locations were more lucrative than others, the allocation of pitches was changed twice a week. 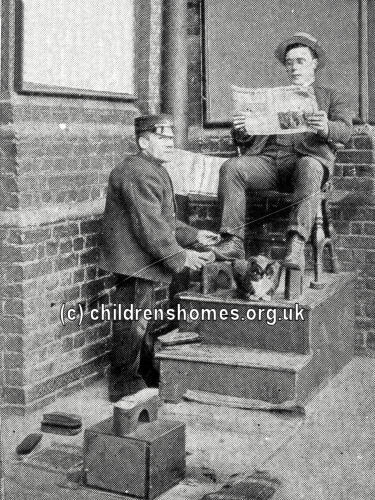 During the Great Exhibition, an average of 25 boys were employed and cleaned 101,000 pairs of shoes, producing an income of more than £500. After the Exhibition closed in October, five of the boys emigrated to America. Following the example of what became known as the Central or 'Reds' Shoeblack Brigade, the movement gradually spread across the whole of London, with around a dozen Brigades eventually being formed, each with its own distinctive uniform. Some Brigades made a point of including boys with various forms of physical disability such as the deaf and dumb and the physically disabled — what were then usually referred to as 'cripples'. In most cases, the Brigades also provided hostel-style accommodation for their members. Over the years, these homes sometimes changed their location so have different addresses at different dates as indicated in the table below. East London (Blue) Shoeblack Society 1854 96 Mansell Street, Whitechapel (in 1884) 80 Blue guernsey Also included cripples, deaf and dumb. Islington and North London Shoeblack Brigade 1858 30 York Road, King's Cross (in 1890) 50 Brown guernsey Also included cripples. North-West London Shoeblack Brigade and Ragged School 1857 33 (or 33A) John Street West (in 1882) 45 Red with black facings; check cap (later black with red band). Also included cripples, deaf and dumb. St Vincent de Paul Shoeblack Brigade (RC) 1857 Newton Street, Holborn No Home? Blue with red cuffs. South London Shoeblack Society 1854 223 Borough High Street, Southwark (in 1884) No home? Red guernsey with black collar Also included cripples, deaf and dumb. Tower Hamlets Mission Shoeblack Brigade 1873 23 Stepney Green (in 1879) 35 Red guernsey with dark blue facings. Union Jack Shoeblack Brigade 1868 8 Three Colt Street, Limehouse 20 Blue with white facings Affiliated with Barnardo's from 1875. In the Central and most other Brigades, the boys' earnings were paid into the home each day with a third of the money paying for their keep, a third being placed into their individual bank savings accounts, and a third given back to them. To encourage honesty and application, prizes ranging from 3s.6d. down to 6d. were awarded each month. The West London Brigade adopted an alternative system where the boys paid 1s. 6d. a week for lodging, and for their board according to what they consumed. They also paid from 4d. to 1s. 8d. a day for their pitches, according to the location. The Shoeblack Brigades had largely disappeared by the onset of the First World War. 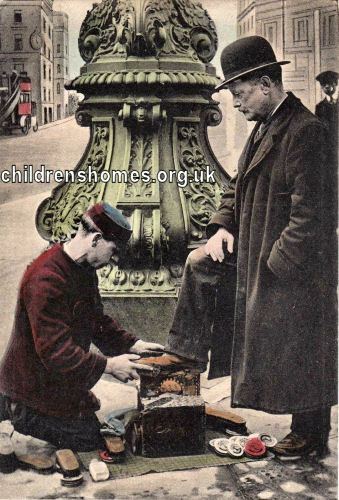 Shoe-shining continued as a London street trade for many years, however, although by the 1960s it had virtually vanished. Boys' Shoeblack Brigades were also started in a few other cities such as Leeds (1869), Manchester (1871) and Dublin (1879).